Pushbullet is the service that will, for example, mirror the notifications that you get on your phone to your computer. It also lets you send text messages from your computer (because it links your phone with it), and now it’s received yet another new feature. From this point on, not only can you send texts, but also MMS messages from your computer. So yes, you can now attach pictures to messages, and these will be sent along as MMS messages. Do note however that your phone needs to run Android 5.0 Lollipop or newer for the MMS feature to work. 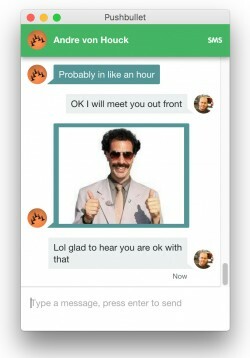 Like everything Pushbullet does, this works because your computer (where you use the Pushbullet app or browser extension) is ‘linked’ to your phone – so that MMS is first sent to your handset, which then sends it further to your contacts. All of this is done seamlessly, of course. The latest version of Pushbullet also increases the reliability of the texting feature, which should result in a better experience. To use these enhancements you need to have the latest version of Pushbullet for Android, naturally, but also the newest iteration of its Chrome extension or Windows desktop app.